Have you ever had a tech tee or running tights that just smelled straight up funky no matter how many times you ran them through the wash? I know I have! I’ve become all too familiar with stocking my laundry room with a gallon jug of vinegar just for that reason. I constantly struggle during the summer months or if I’ve left clothes in my gym bag for too long. It would always seem that no matter how much I washed my technical fabrics the stench just wouldn’t disappear. Well, it looks like that may be a thing of the past and I just may be able to finally ditch the vinegar! 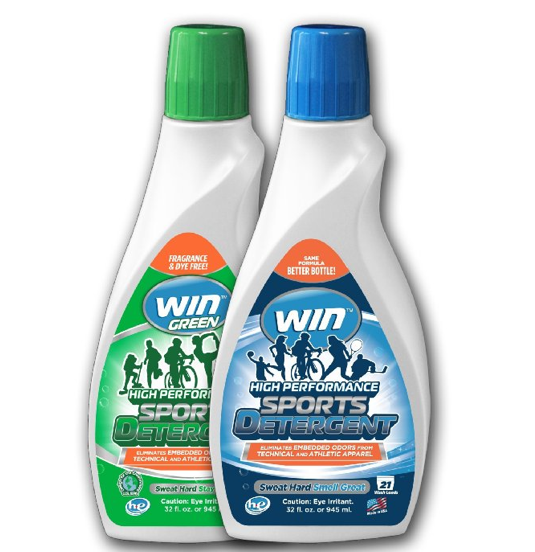 WIN Sports Detergent is a specially formulated detergent that essentially removes embedded sports odors. My first load of stinky gym clothes was the ultimate of tests. I decided to provide the best stench inducing environment for my gear–I packed 2 days worth of sweat soaked clothes into a ziplock bag and let it stew for a week. It was rather rank by the time I was ready to try out the detergent so I had high hopes. If the detergent didn’t work I would know right away and I would also be stuck with the funk. Lucky me! The clothes came out fresh and stank free! The best part is that the amount needed is fairly low and one bottle gets you 21 loads of fresh duds. For my second and third trials I decided to up the ante and include a few pairs of my son’s pee laden jammies (he’s still prone to the occasional accident). Both batches turned out fresh and any scent of urine was gone. I am definitely sold! These detergents are great because they aren’t just a fragrant method of covering up odors, they actually work to break them down and eliminate them completely. Have you ever tried special sports detergents? Well, guess what?! Now’s your chance! You can enter to win 2 free bottles (one regular, one green) of Win Detergent. That’s 42 loads worth of detergent for FREE!! If you don’t win you can still save $1 on this great detergent by purchasing through WIN’s Amazon and using the discount code: WINGIVE1. To enter the giveaway visit my FB page and use the giveaway tab! Or go to my rafflecopter link to enter here.